Yes, here it is! Another re-boot of a classic comic book ("graphic novel") ready to be one of the box office smashes of the summer. Be warned...this thing is looooong (143 minutes), so watch your liquid intake! I found it interesting that in the packed theater last night, I didn't see ONE person take a quick potty break, everyone was fascinated as we watched a little boy learn to cope with x-ray vision, super hearing and uncommon strength. I had never given it a second thought, had you? 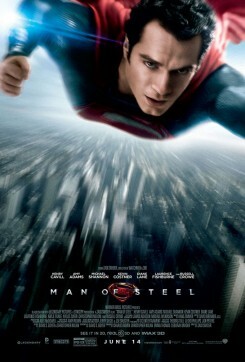 * Henry Cavill ("Immortals") is our appealing new Kal-El/Superman. I hope this Brit is ready for the inevitable wave of publicity. He certainly looks the part and didn't embarrass himself in any way. He's craggier than Christopher Reeve, but has that same impossibly good-looking, sweet presence. * Amy Adams ("Trouble with the Curve") is Lois Lane, the bright-eyed reporter who is in his face from the get-go. She's too smart and is eager to spill the beans about our hero's identity. What a scoop! * Russell Crowe ("Les Miserables") as Jor-El, sends his infant son from Krypton, his own doomed planet. The heart and soul of this 90-minute plot is contained in that decision. * Diane Lane ("Secretariat") is Martha Kent, Clark's beloved "Ma." * Laurence Fishburne ("Contagion") is The Daily Planet newspaper publisher Perry White, in a nice update of the character. * Michael Shannon ("The Iceman") is General Zod, the main villain from Krypton, a zealot who never doubts for a moment that what HE believes, is absolutely right and true. * Antje Traue ("Seventh Son") is Faora-Ul, another survivor of Krypton; she proves to be every bit as indestructible as the other two. Expect surprisingly little blood, minimal profanity, one chaste kiss, many delicious bits of humor and the joy of watching decent people trying their best to do what's right. Oh! And be sure to suspend disbelief; this is, after all, a comic book.